With Gates EZ Align® precision laser you can align easier and faster your entire industrial belt drives. Use powerful reflected laser line technology for maximum angular accuracy on belt drives up to six feet in length. Fast identification of current types of misalignment, including offset, vertical- and horizontal-angle misalignment. 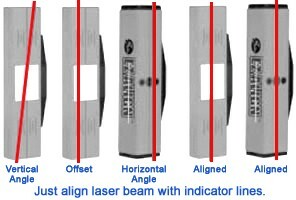 The EZ Align transmitter products a small laser line to a reflector placed on the opposite pulley and instantly gives indications offset and vertical-angle misalignment. It automatically reflected back to the transmitter and indicating horizontal-angle misalignment. 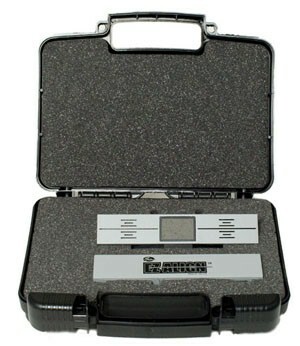 Magnetically attaching to the inner or outer faces of industrial pulleys to give a quick and accurate drive alignment. Incredibly lightweight and simply to use. 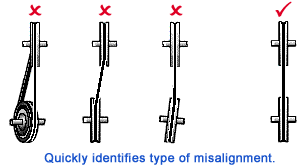 A unique person can analyze pulley misalignment in few minutes without formation. Deliver with a durable carrying case, so no small part could be lost. Noises, vibrations, and usury on pulleys, belts and bearings … A stop machine could be caused by improper pulley alignment. It can be avoid by using Gates’ new laser alignment device AT-1. The standard method to measure misalignment is putting a straight edge up to the pulleys. By using the LASER AT-1, there is a second method much faster and more accurate. Installed in few seconds, the laser line projected on the targets indicates you to quickly ascertain and correct misalignment. The LASER AT-1 identifies parallel and angular misalignment between pulleys and it can be used for pulley diameters of 60 mm and larger. It can be installed on non-magnetic pulleys with a double sided adhesive tape and used on both horizontally and vertically mounted machines. The Laser AT-1 is rapidly attached. You can facilely see the laser line projection. When the line lies in the slots of the targets, the machine is in the right position. It provides a fast and precise alignment.